Here is some fascinating information about James Joyce that you can Read, Watch or Listen. Use these resources as the first step in your exploration of the author, his work and his times. Here is a short but comprehensive biographical outline of the life of James Joyce. Developed by The James Joyce Centre in Dublin, Ireland. We recommend this site if you are new to the author, or a Joycean buff looking for new insight and information. The James Joyce Centre in Dublin is an excellent source for information and insight on the author. On the Works page, you can find out what each novel is about and how Joyce approached these unique literary creations. Don’t miss the Recommended Reading lists. Michael Groden is Distinguished University Professor Emeritus at Western University. He developed this interactive annotated version of Ulysses. Make sure you follow the site guide on the Notes page. Michael Seidel, Jesse and George Siegel Professor Emeritus in Literature and Humanities, Columbia University, developed a Ground Plan of Ulysses. This is a condensed version of Gilbert’s schema designed to help you understand where and when events take place. 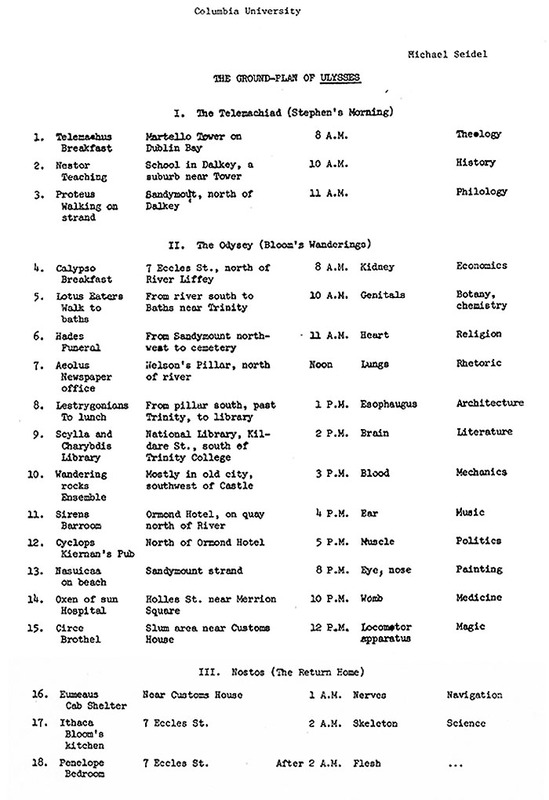 Complete list of related materials for Ulysses on the Columbia University site. Online and Interactive. The Joyce Project puts Ulysses online outlined in the mythic schema. Mouse over annotated text to learn more about its context and meaning. Lots of intriguing esoterica on this site alongside valuable information on the characters and their times. More coming soon as the site develops. The University of British Columbia uses Google Maps to provide a Walking Ulysses. This interactive site makes it possible to follow the novel’s characters through Dublin on Bloomsday, June 16, 1904. An Irish-American rocker and two writers — big fans of Dubliners— talk about how the Irish writer’s collection of stories excites and inspires them: author Victor LaValle, Larry Kirwan of the band Black 47, and author and broadcaster Frank Delaney. Honours the 100th anniversary of the publication of Dubliners. Posted to YouTube August 4, 2014. 90 minutes of selected passages from Finnegans Wake come alive through a fine cast of Irish actors. Directed by Mary Ellen Bute, Screenplay by Mary Manning, Cinematography by Ted Nemeth, Music by Elliot Kaplan. Audio recording of Finnegans Wake, read by Patrick Healy. Audio recording of Ulysses, high quality and in stereo. Audio recording of A Portrait of the Artist as a Young Man.